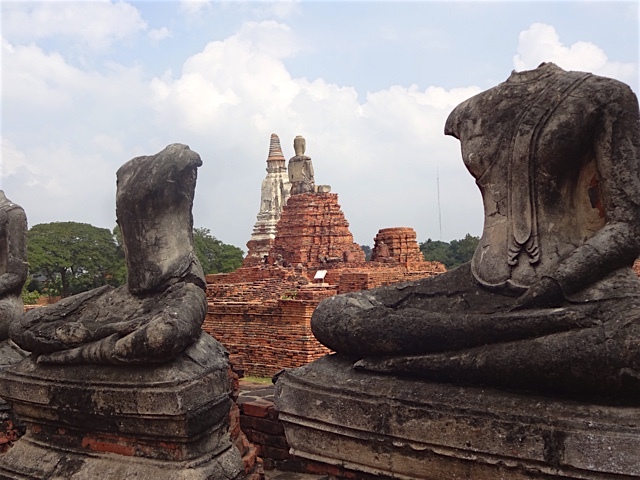 Upon arriving in Bangkok on our minivan ride from the Koh Chang ferry, we discovered to our surprise that we only had an hour before catching a commuter train to Ayuthaya, about 70km north of the city. We had originally intended to catch a later train, but were told there was no such thing. What we got was an entire train of 3rd class seats–2 by 2 facing–with no A/C. 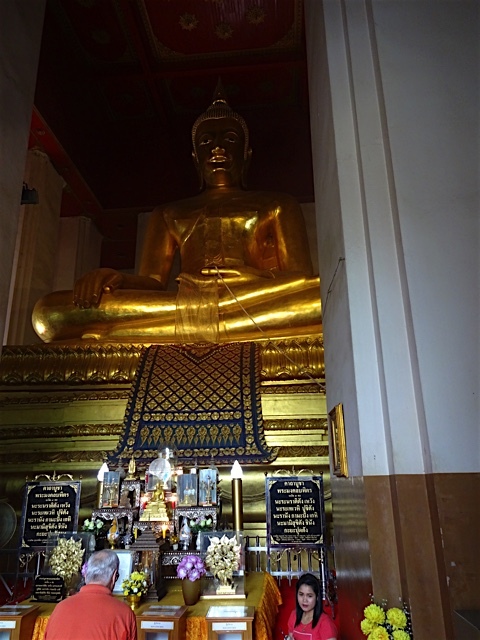 The whole trip was to take 2 hours with many stops; an education in Bangkok city life. And what an education it was. I was so mesmerised by the passing scene on this slow journey north that it never entered my mind to take pictures until much later. 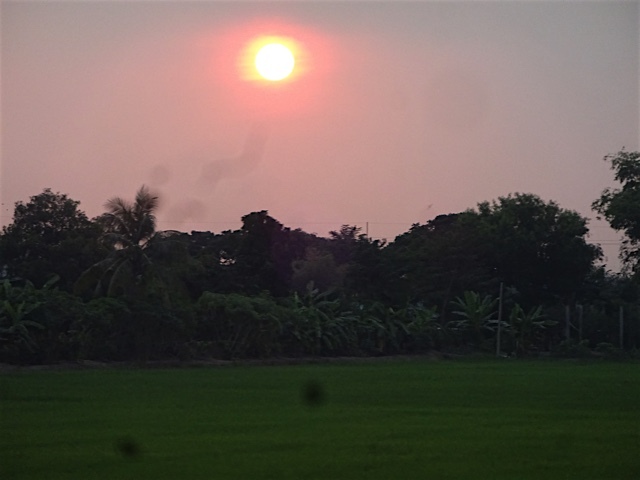 From Hualamphong station, we lurched and slow-walked northward. Here it becomes obvious that urbanisation and economic growth does not favour all. There is abject poverty along the tracks, people living in the merest of shelters in ghetto neighborhoods, corrugated tin, umbrellas(literally), packed together by the tracks between stations, the roofs secured by rocks, sandbags, debris. There is trash, the remains of construction, piles of junk everywhere. Passing further north, the presence of elevated freeway construction in all phases appears on both sides of the tracks. Mountains of re-bar, girders, scaffolding, steel framing for the concrete supports, moveable concrete barriers, miles and miles of heavy equipment by the road, the chaos of traffic navigating it all. There seem to be as many cars entering the city as leaving. The evidence of community displacement due to all this construction is everywhere. Construction workers wear long sleeves, hoods and helmets as they labor in the 90-degree heat. What were previously close-packed ramshackle structures here gradually recede into the enveloping jungle. 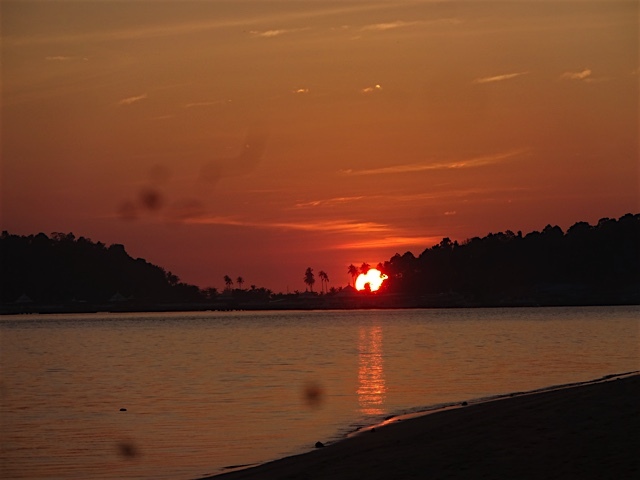 At least here in the south, Thailand is a second world country hot on the heels of first world status, just when the first world is reluctantly realising it must bring itself to a screeching halt. Still, Thailand’s per capita emissions are a mere 25% of the US. But climbing. It took us 90 minutes to really clear the city, passing into the verdant, orderly and relatively prosperous countryside. Cars become a rarity. Children on bicycles become commonplace. Houses are either concrete or Thai-style wood on stilts. The pace is dramatically different. The double and triple peaked ornamented orange roofs of the local Wats, rising above all the flatland of single story construction, capture the eye. Everything is neat and clean. No masses of debris, no mountains of trash. The red sun in a clear sky flickers through trees as it slowly sets. Tranquility abides. 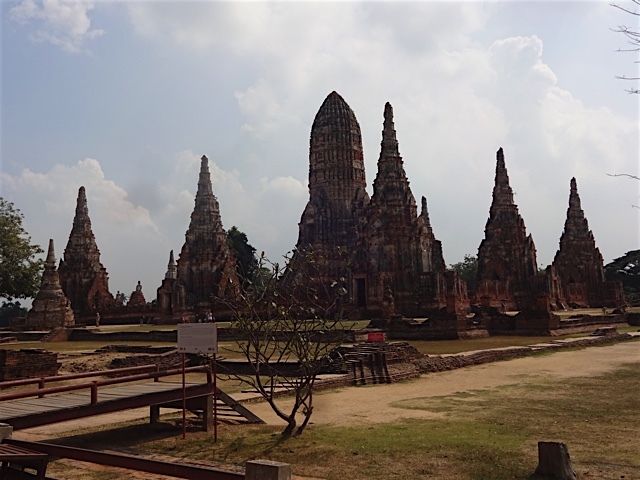 Ayuthaya, on the other hand, is a small city far up the Chao Praya river from Bangkok. It winds through the city, creating a sizeable island that is home to dozens of historic religious sites, former palaces, monasteries and temples. This was once the historic capital of the Kingdom of Siam. Its splendour in its heyday dates back to the 13th and 14th centuries and was unrivalled in this region. The entire island is now a historical park embedded with the commerce of a modern city and tourist destination, part of which is also a UNESCO World Heritage Site. 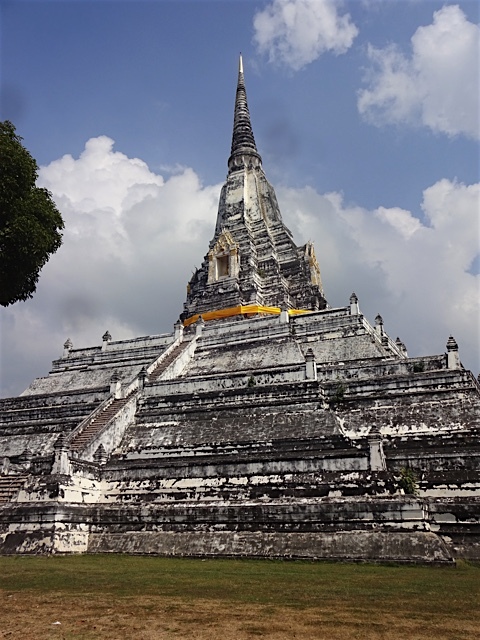 Wat Phu Kao Thong: This pagoda changed hands so many times over several centuries, partially destroyed and rebuilt, that it contains layered Thai and Burmese elements. 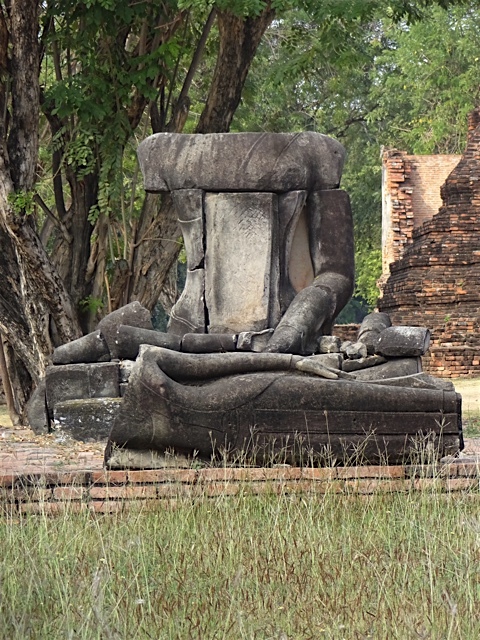 Ayuthaya was invaded and destroyed multiple times by the Burmese who in the most recent invasion (1767) attempted to uproot the very essence of Thai culture by destroying Ayuthaya. 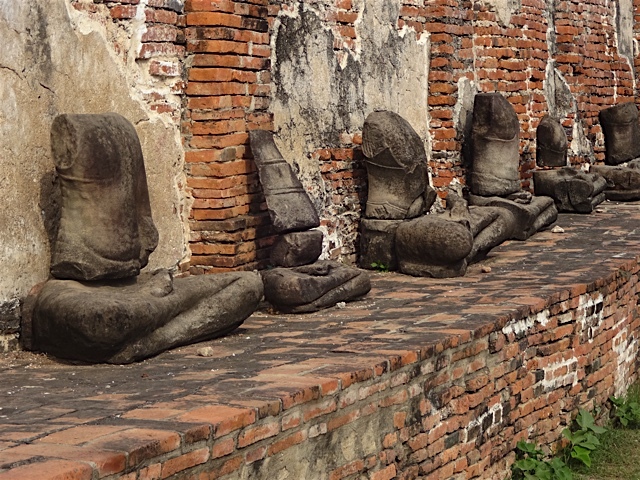 They cut off the heads of thousands of buddha statues lining the walls and courtyards of the temples. A buddha with a head is a rarity here. The most recent extensive damage done to this entire low-lying city were floods in 2011. The temples are reminiscent of the huge 11th-12th century complexes built by the Khmer at Angkor Wat, Angkor Tom, Prea Khan and Bantay Srea, covering many acres and bearing some of the same architectural elements such as concentric walled compounds, central spires, assembly halls, ordination chambers, cloisters and many shrines. 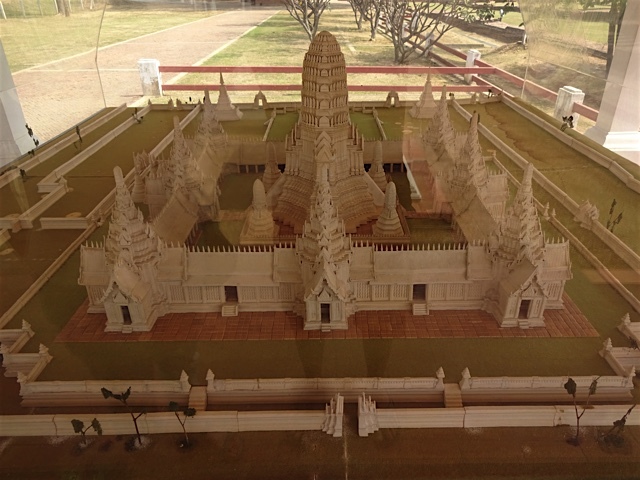 Even though numerous Thai kings devoted huge resources to renovation and extension of the grounds, even building new ones, it’s hard to imagine they were quite as enlightened and beneficent as the Khmer. 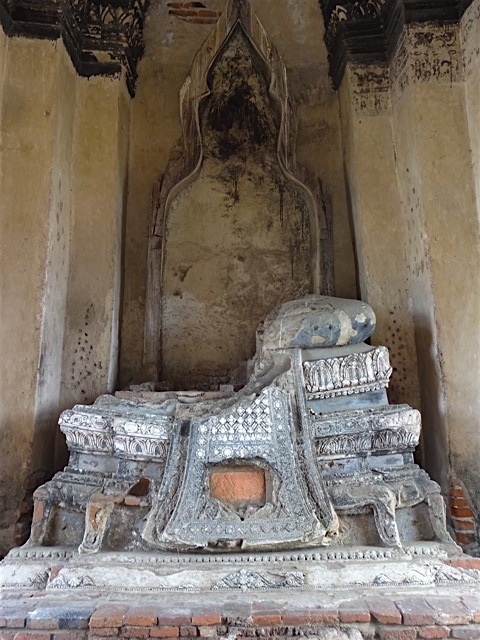 One of them punished his own son for having an affair with one of the father’s concubines by having him whipped to death…and then burying his ashes in a special chedi devoted to his memory. 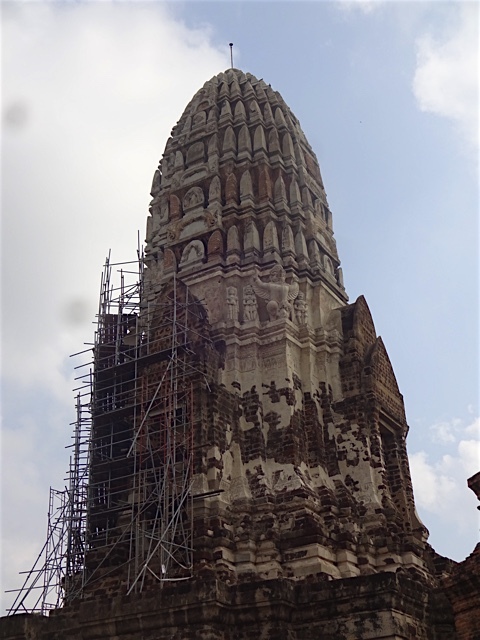 Wat Rachaburana: Early last century, a crypt containing magnificent gold objects was discovered underneath this prang. The police official put in charge of it was later found to be complicit in the looting of those objects. Plus ca change, plus c’est la meme chose. Throughout history, since well before the Common Era, the destruction of religious sites has been standard procedure for conquering armies. Whether it’s the Burmese in Siam, the Chinese in Tibet, ISIS in Iraq or anywhere else, such tactics always fail because the destruction of the messenger can never destroy a message that lives in the heart of its followers. 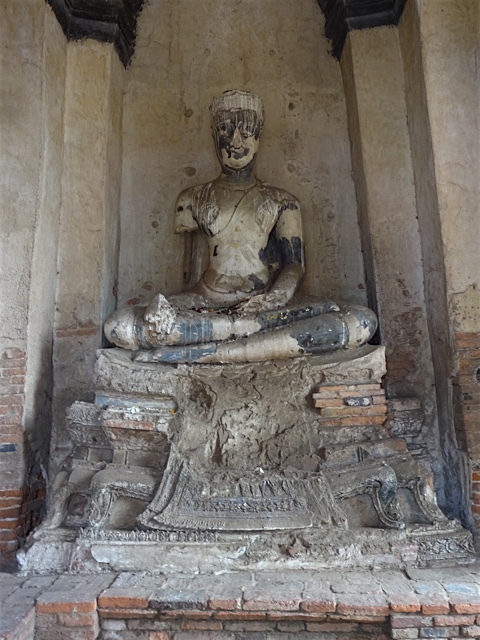 If there is anything the history of Ayuthaya reminds us, it may be that the worship of figures such as Buddha, Jesus or any other prophet/messenger is not the same as living the message. 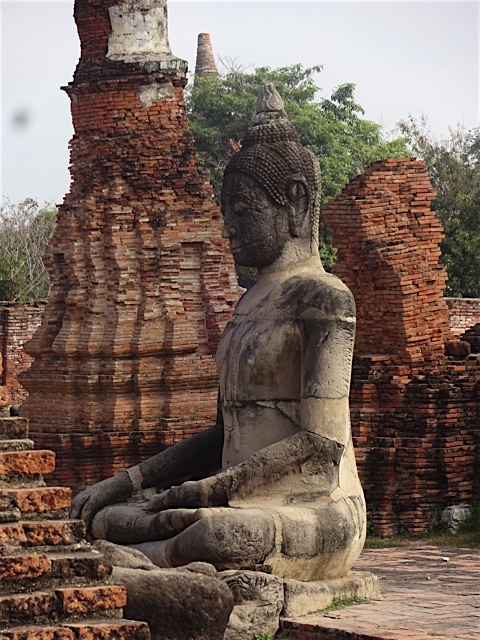 In fact, for every head of buddha destroyed in Ayuthaya or for that matter every monastery destroyed in Tibet, a new head, a new teacher emerged to continue bringing the message forward. And incidentally, there are no images of Mohammed mounted in any mosque or holy place of Islam. The messenger is not worshipped. 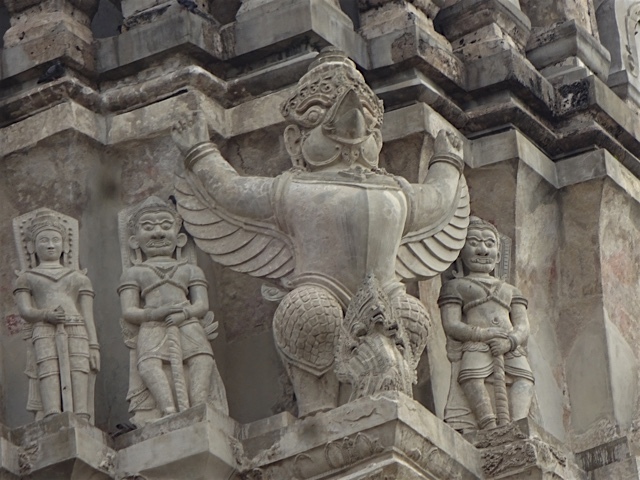 Although we started early and had an entire day and a motorbike to cruise the Ayuthaya Historical Park, we were soaked in the humidity by 10:30 am. Still, between checking the map and occasionally letting spontaneity rule, we managed to see 6-7 amazing sites. By that time we were drained, ready for a shower and a cold beverage. I only regret not seeing the Chantharkasem National Museum. It closes at 4pm. 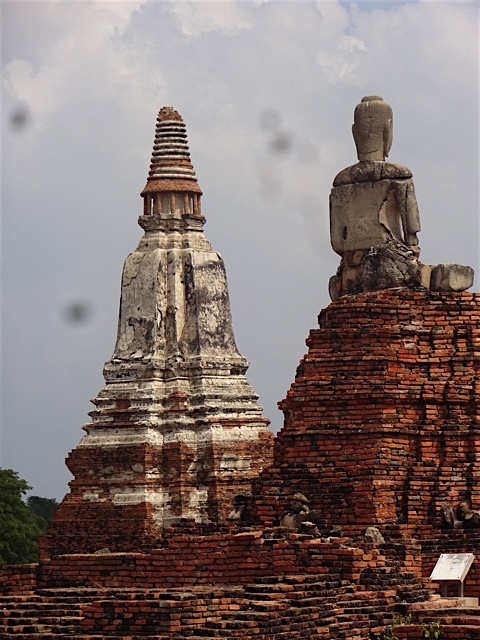 This entry was posted in Personal, Thailand, Travel and tagged Ayuthaya, Burmese destruction of Ayuthaya, Kingdom of Siam, Temples of Ayuthaya, Thai railways, thailand, UNESCO World Heritage sites, Wat, Wat Chaiwatthanaram, Wat Maha That by garyhorvitz. Bookmark the permalink.